ADMISSION: free for New Jersey Jazz Society members and $10 for non-members. There is also a $10 food/beverage minimum. For more information, music@njjs.org, or call 973 214-3380. The New Jersey Jazz Society funds annual partial scholarship grants at five New Jersey universities with degree programs in jazz studies: Montclair State, New Jersey City University, Rowan, William Paterson, and Rutgers. This year’s scholarships totaled $7,900. 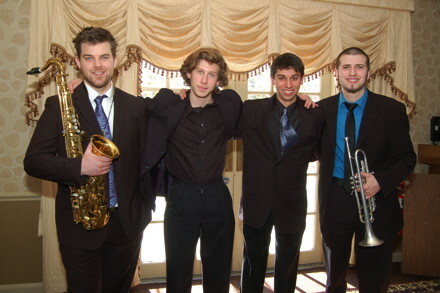 On Sunday, May 20, scholarship winners from four of those schools will perform as part of an All-Star College Ensemble at the NJJS monthly jazz social. They are: NJCU drummer Christian Paredes (Don Robertson Scholarship), a native of La Paz, Bolivia; Rowan bassist Matthew Kaefer (Bill Walters Scholarship), a resident of Ramsey and graduate of Ramsey High School; Montclair State trumpeter Carlos Juncal (NJ Jazz Society Scholarship), a resident of Newark and graduate of Arts High School in Newark; Montclair State alto saxophonist Salvatore Alaimo (NJ Jazz Society Scholarship), a resident of Staten Island and graduate of Tottenville High School; and William Paterson guitarist Jianing Yang (Jack Stine Scholarship), here on a student visa from Beijing, China. NJCU student Nicholas Valencia of Jersey City is also receiving a Don Robertson Scholarship, but he is unable to perform at the May 20th event. Pablo Hernandez of Rutgers, a resident of Edgewood, MD, is the recipient of this year’s Pee Wee Russell Memorial Scholarship, but he will not be playing at the social. Vocalist Jackie Gage, who has appeared with drummer Winard Harper and vocalist Antoinette Montague, and pianist Nick Masters, a recent William Paterson graduate who studied under pianist Harold Maybern, have been hired to join the ensemble. Contributions to the NJ Jazz Society scholarship fund can be made by sending checks payable to NJJS Scholarship to NJJS Scholarship, c/o Mike Katz, 382 Springfield Ave., Suite 217, Summit, NJ 07901 or by credit card on njjs.org. NJJS is a 501 (c)3 non-profit organization, and all contributions are tax deductible to the extent allowable by law. Funding for the New Jersey Jazz Society socials has been made possible in part by Morris Arts through the N.J. State Council on the Arts/Department of State a partner agency of the National Endowment for the Arts.